Record harvests, a strong dollar and cheap oil are the factors which could shake up the multibillion-dollar global wheat market. 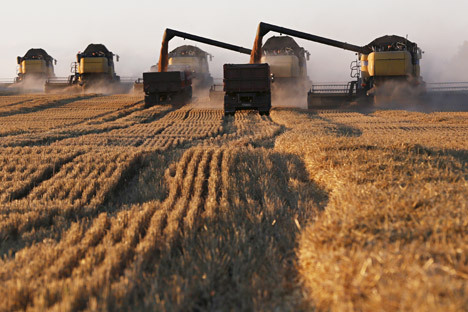 Russian agriculture could soon become the country's second biggest export after energy. Wheat exports from Russia are expected to set a new record this year, outpacing the biggest wheat exporters Canada and the US, reports the Wall Street Journal, citing the US Department of Agriculture (USDA). According to USDA statistics, Russian exports this year would rise three percent to 23.5 million metric tons. US wheat exports are projected to fall to a 44-year low, to 21.8 million tons. Canada's exports are expected to be 20.5 million tons, down from 24.1 million the year previous. While the price for wheat is falling, a strong US dollar makes American wheat more expensive for buyers using other currencies. On the contrary, a weaker Russian ruble makes the country’s exports more competitive, with long-standing US customers shifting wheat purchases to Russia.“There is a lot of wheat out there, and it all comes down to price,”said Greg Harvey, the chief executive of Singapore-based miller Interflour Group Pte. Africa’s largest economy Nigeria was once a top US wheat customer but has cut the purchases by almost half in the past five years. “This season we’re selling more to distant destinations like Nigeria…and we also supplied some wheat to Mexico,” Andrey Sizov, managing director of Russian agriculture consulting firm SovEcon told the WSJ. Russia has boosted exports to one of its biggest customers Egypt. Exports currently average 4-5 million tons a year are expected to reach six million tons per year. Moscow and Cairo are also discussing Russian participation in the construction of grain infrastructure in Egypt. In June, Russia renewed grain deliveries to Iran. The shipments are reported to be at least 1.3 million tons per year. Russian agriculture could soon become the country's second biggest export after energy, according to Russian Agriculture Minister Aleksandr Tkachev. Last year, Russia's top exports were: oil at $90 billion; gas $40 billion; arms $15 billion; and agriculture $15 billion.